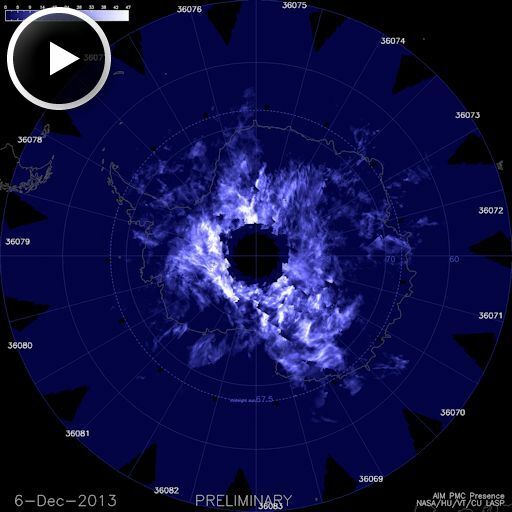 The season of noctilucent, "night-shining", clouds has begun in the southern hemisphere and NASA's AIM spacecraft is monitoring a vast bank of rippling electric-blue NLCs blanketing almost all of Antarctica. Noctilucent clouds (electric-blue clouds or NLCs) were first seen in 1885, about two years after the powerful eruption of Krakatoa in Indonesia, which hurled plumes of ash as high as 80 km into Earth's atmosphere but NLCs have intensified over the last few years and some researchers see this is a sign of climate change. "When methane makes its way into the upper atmosphere, it is oxidized by a complex series of reactions to form water vapor," explains Hampton University Professor James Russell, the principal investigator of AIM." This extra water vapor is then available to grow ice crystals for NLCs." The following movie shows last two weeks of AIM data. It chronicles the onset of the clouds in late November and their rapid spread into December 2013. The early start is extra-puzzling because of the solar cycle. Researchers have long known that NLCs tend to peak during solar minimum and bottom-out during solar maximum - a fairly strong anti-correlation. "If anything, we would have expected a later start this year because the solar cycle is near its maximum," Randall says. "So much for expectations." I concur completely, Lynn. Well done, and well said. Glory to God who created it all! Love looking at the God's creation. It always amazes me. That was beautiful so was the music. Thanks for all your time and expertise to share this with us.